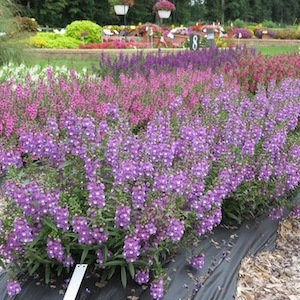 As we transition from summer to fall, one plant that still looks fantastic in the garden is angelonia. Commonly known as summer snapdragon, Angelonias thrive in heat and humidity and are very low maintenance. In recent years, flower breeders have worked their magic to improve their presentation and range of colors. Suntory Flowers in Japan has bred Sungelonia angelonias in three distinct colors – Blue, White, and Deep Pink. Unlike previous angelonias, that can get floppy, Sungelonia holds its stems upright and produces dense foliage and flowers. Plants have a well-balanced form. You can plant them in a border or in pots; they require no deadheading or pruning and produce blooms up the stalk throughout the summer. They make a nice upright thriller in mixed containers. Sungelonias are perfect for patio containers and landscapes, have excellent branching, and bloom profusely. This summer, the editors at Sunset magazine recommended Sungelonia as “heat seekers” in the June issue, after evaluating the three varieties in their test garden the previous summer. The entire series also received the Prairie Star Winner award from Kansas State University in 2012.